DOREEN BAINGANA, born in Entebbe, Uganda, says that history drew her into creative writing. “I found the story part of ‘history’ fascinating, thanks to the primary school textbook, People on The Move, by Joyce Masembe,” she said. 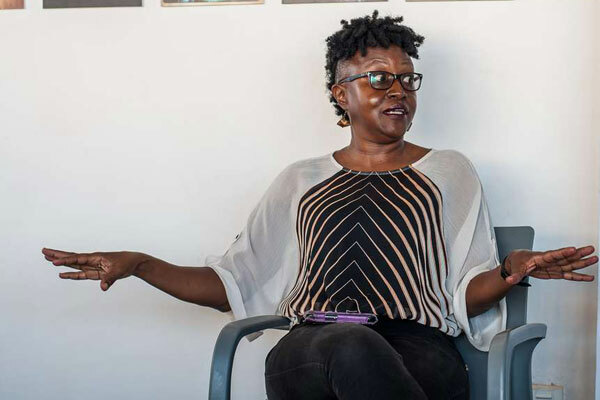 She says the biggest challenge facing Ugandan creative writers is perfecting their craft. “This is why set up the Mawazo Africa Writing Institute. Baingana’s debut collection of short stories, Tropical Fish: Stories out of Entebbe (2005), is about a Ugandan girl navigating adolescence. Set mostly in Entebbe with stops in Kampala and Los Angeles, the book depicts the life of Christine Mugisha and her family following the toppling of the Idi Amin’s regime of dictatorship. Tropical Fish won the 2006 Commonwealth Prize for First Book, Africa Region. Baingana has written two children’s books: Gamba the Gecko Wants to Drum (2010), and My Fingers are Stuck (2010). She has also penned two short stories: Hunger, in Seventh Street Alchemy(2005) and Christianity Killed the Cat (2009). Writers Short Fiction Prize. She has twice been a finalist for the Caine Prize for African Writing in 2004 and 2005. Baingana was managing editor at Storymoja, a publishing house in Kenya that organises the annual Storymoja Hay Festival, and a judge for the Hurston/Wright Prize for Debut Fiction, the Golden Baobab Prize for Children’s Literature, and the 2013 Commonwealth Short Story Prize. She is a Bread Loaf Writers Conference Fellow and a Fellow at the Rockefeller Foundation Bellagio Centre in Italy, and chairperson of Femrite: The Uganda Women Writers’ Association. What is your biggest off-duty interest? Swimming or tying out cheza, a type of dance exercise to afrobeat. Toastmasters, where I’ve met an interesting group of people (outside the literary echo chamber) while working a new set of mind-muscles. What signifies your personal style? When in East Africa, where are you most likely to be whiling away your time on a Saturday afternoon? I’m usually at Laico Lake Victoria Hotel, Entebbe, swimming with my son. Lamu Island in Kenya. I visited there 10 years ago and it was a step back in time: Simple, with a sense of real community (which we were destroying as tourists), with a lovely flavour of cultures reaching across the Indian Ocean, and of course, it is physically astounding. What do you consider to be East Africa’s greatest strength? It is that we, in general, bounce back from catastrophe. The Sympathizer, by Viet Thanh Nguyen. It questions why so many third world countries are in such a political mess. This scathing portrayal of war and postcolonial interference has some answers. Which movie had a big impact on you? There are so many! But I found Blue, by Derek Jarman both beautiful and true. It is about meditation on living with HIV/Aids back when there were no antiretrovirals. Different mood, different music. 1960s jazz is both calming and exciting and keeps me curious. I wish I understood better the Ugandan Kadongo Kamu music. Mawazo Africa Writing Institute’s site at www.mawazowritingafrica.com. We aim to enhance the teaching of creative writing across Africa. What’s a constant in your fridge?